This is really exciting. I've been meaning to complete this compilation for two years, since I produced the cover for these comics in Offset class. This is really my first full size comic book, and most definitely the first thing I've been proud enough of and confident enough in to send off to publishers, for example, or drop at Quimby's. That's right, I finally have comics at Quimby's. This book contains five comics and one prose piece. Four of the comics are available in full to read on my blog; the fifth comic is not online, will never be online, and yeah, if you want to read you have to get the book. The written story is the version of They Glistened that I read at Brain Frame 3. You can see me talk about and flip through Compiled in the video above; here are some closer images of the cover design. ELSEWHERE: My mother interviewed me about Tumblr! I didn't know she was going to put the audio online, I just thought she was using it to take notes. Oh well, I guess the sounds of me eating and knocking over things in the background aren't that noticeable. The beat goes on, as they say. This collaborative poster was created by Grant Reynolds and myself, in a record amount of time. 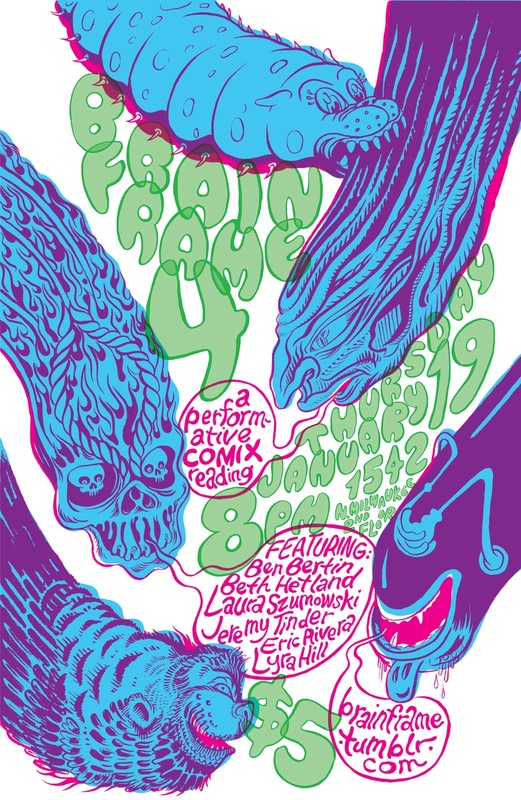 This is the last time I'll be reading at Brain Frame for a while. I'm particularly excited about the comics I'll be performing (a newer, fancier version of Copulate, and Go Down). Additionally, we will have fresh, new copies of Chromazoid #1 available for sale.